The resume below was written for an individual with experience in business administration and office management. The example can be helpful for most mid to senior level administrative professionals. 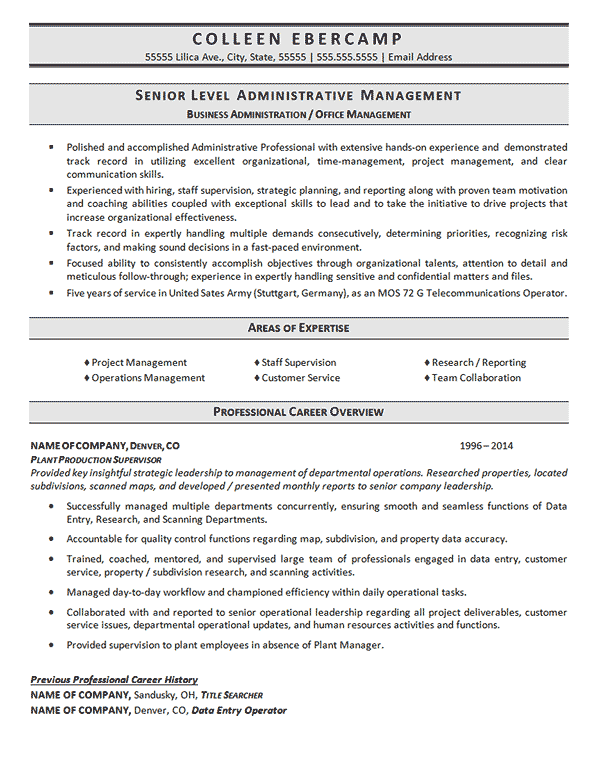 The style includes a headline that states their main target “Senior Level Administrative Management” with sub headings that include office management. The summary utilizes five statements in a bullet list format that explain the core qualifications of this candidate. Areas of expertise provide the snapshot of their strongest attributes. Experience is formatted in reverse chronological order where the description of the job is written under the job title in italic font. Bullet points highlight achievements or areas the writer wanted to emphasize. Previous job experience is listed but since the jobs are unrelated the writer chose not to extrapolate with long descriptions. Provided key insightful strategic leadership to management of departmental operations. Researched properties, located subdivisions, scanned maps, and developed / presented monthly reports to senior company leadership. Successfully managed multiple departments concurrently, ensuring smooth and seamless functions of Data Entry, Research, and Scanning Departments. Accountable for quality control functions regarding map, subdivision, and property data accuracy. Trained, coached, mentored, and supervised large team of professionals engaged in data entry, customer service, property / subdivision research, and scanning activities. Managed day-to-day workflow and championed efficiency within daily operational tasks. Collaborated with and reported to senior operational leadership regarding all project deliverables, customer service issues, departmental operational updates, and human resources activities and functions. Provided supervision to plant employees in absence of Plant Manager.